LCD Soundsystem is another dance-punk with a penchant for using cowbell (see also The Rapture, Death from Above 1979, and Hot Hot Heat). 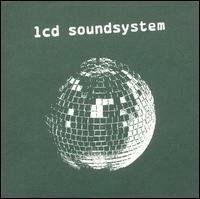 There is a little more dance LCD Soundsystem's dance-punk. The band is the brainchild of James Murphy, co-founder of electro-friendly DFA Records. The song is fairly simple. The French techno duo, Daft Punk, is playing this dude's house. I guess we can assume it's a friend of the singer, because he apparently knows how to show Daft Punk a good time. He talks about how long he's waited and how the house is ready for when "All the robots descend from the bus/There's a freakout brewin' at my house, my house/In the basement..." (Daft Punk are known for performing and appearing in public dressed as robots, complete with elaborate electronic helmets.) There's a beat of cowbell here and there during the verses, but there is a cowbell solo after the second chorus. (Actually, it's probably an agogô, but it's close enough).